I already failed at my New Year’s Resolution to review every Masters of the Universe Classics figure. Huntara did me in, and then I just got busy around the time Angella arrived. I will probably go back and take a look at Angella because she is a nice figure, but Huntara is just dull as dirt. 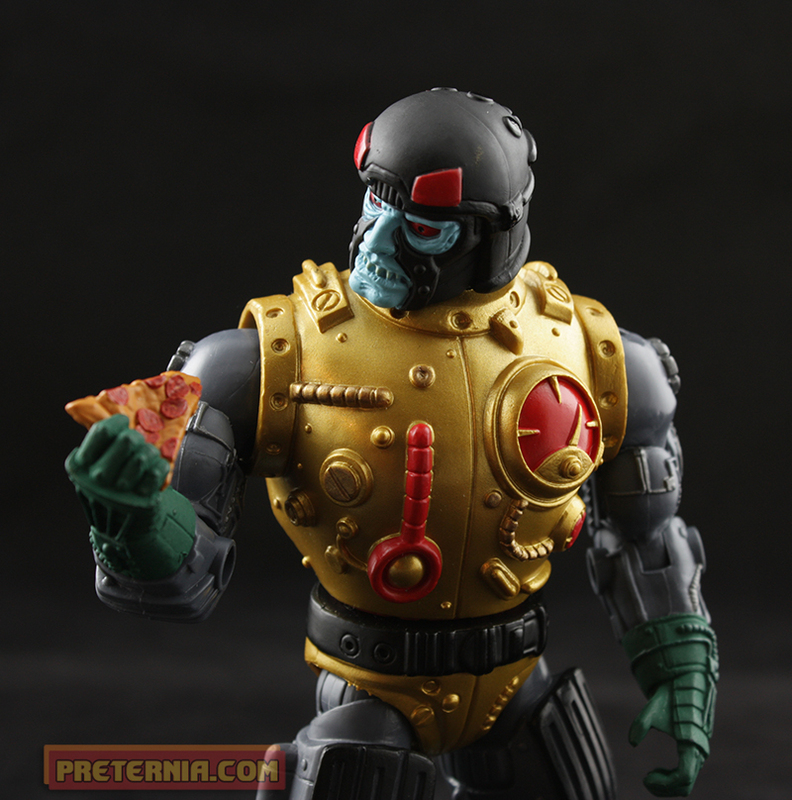 Today we have a pretty cool fellow who feels VERY vintage inspired: Blast Attak. The first thing that I noticed when I removed Blast Attak from his brown mailer box is that I think I prefer the brown mailer over the old white ones. White is just so out these days, brown really is a much nicer complementary shade for the box that keeps these figures safe. Next, I noticed that he was under the “Snake Men” faction. Interesting. For once in my life I decided to check out the bio to see why; after all he isn’t overly snakey. It turns out he was created via Skeletor’s magic and then stolen by the Snake Men and reprogrammed. This is a slight variation to the story that was packed with the original Blast Attak. His vintage version came with a comic showing him as a creation of King Hsss. This is probably why I don’t read the bios, because honestly who cares? Trying to make sense of Masters of the Universe mythology is an impossible task. Just make up your own and be happy with that. 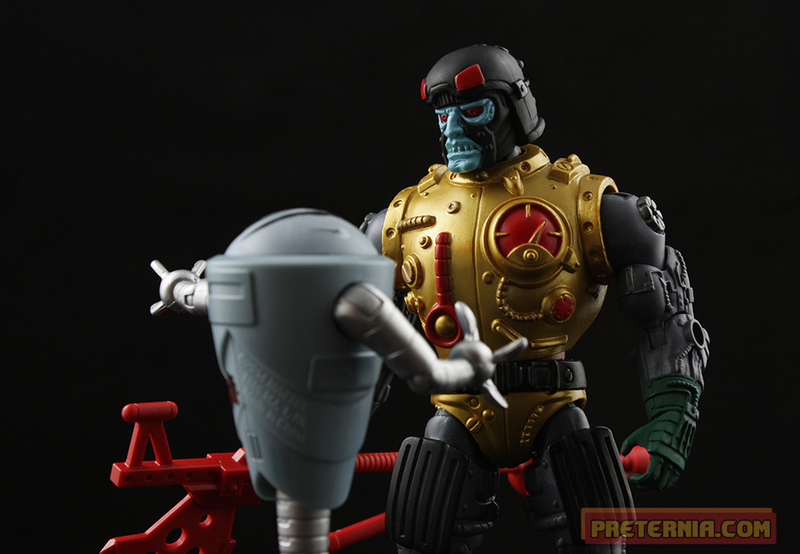 Blast Attak is a very straight interpretation of the vintage figure. He’s pretty much a scaled up version of the old figure on a Classics body, but with one difference: no action feature. The original Blast Attak split in half right down the center of his body to emulate his explosion or namesake ability. 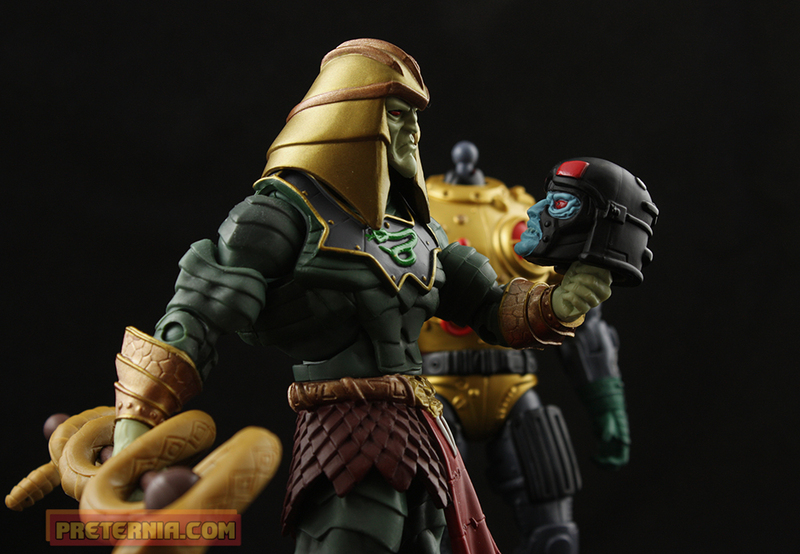 The MOTUC version does not do this. We can split figures at the waist, but through the middle is off limits! I’m actually a bit surprised that they did not try to do some type of exploding effect with his overlay, however. Blast Attak’s overlay is actually one of the few in the line that isn’t even removable. It’s glued in place so you can’t even split it at the seem on his back unless you want to cut it. The one nice thing about the glued overlay, though, is that his arms can lay down at his sides. No body-builder proportions with this approach, and that is pretty cool. He reuses the Roboto arms, but the legs are brand new and look fantastic! I had a slight fear that if they wanted to save some money they would pull out the Trap-Jaw legs again. 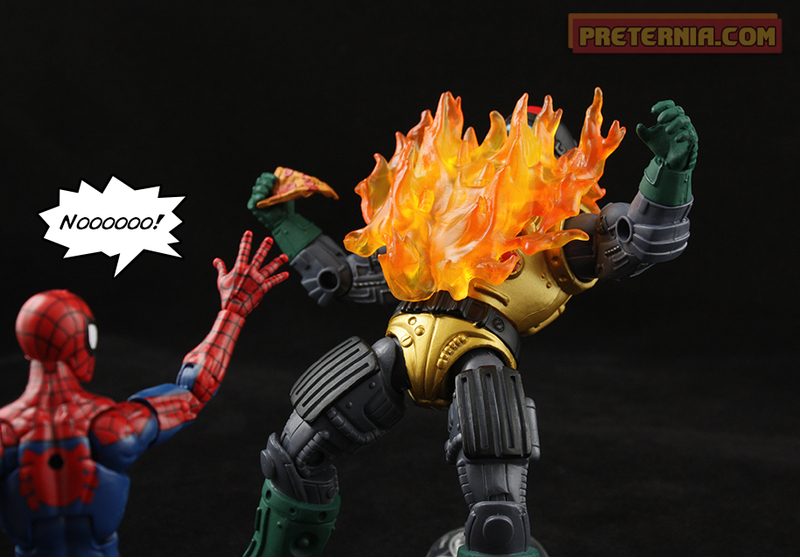 Thankfully this did not happen and they gave him proper vintage styled legs. If you weren’t into the muppet head on Clawful then you may have an issue with his head. It’s as “derp” as the vintage one. I like it though. What exactly should a big dumb robot who blows himself actually look like? He comes with two accessories: a giant red techno-staff-axe-device, and a whip. They both can only be held with his right hand since the left one is a bit too far open. When I noticed he had Roboto hands I held a slight hope that they came off, but they do not. Oh well! I wasn’t really all that excited about Blast Attak when he was announced. I don’t believe he was one of the vintage figures I had as a kid, and on top of that the design doesn’t do much for me. While I don’t love him, I do think he’s an acceptable figure that was well executed. He’s grown on me a bit too in the week I’ve had him. I like big doofy robots, and he’s about as goofy as they come. 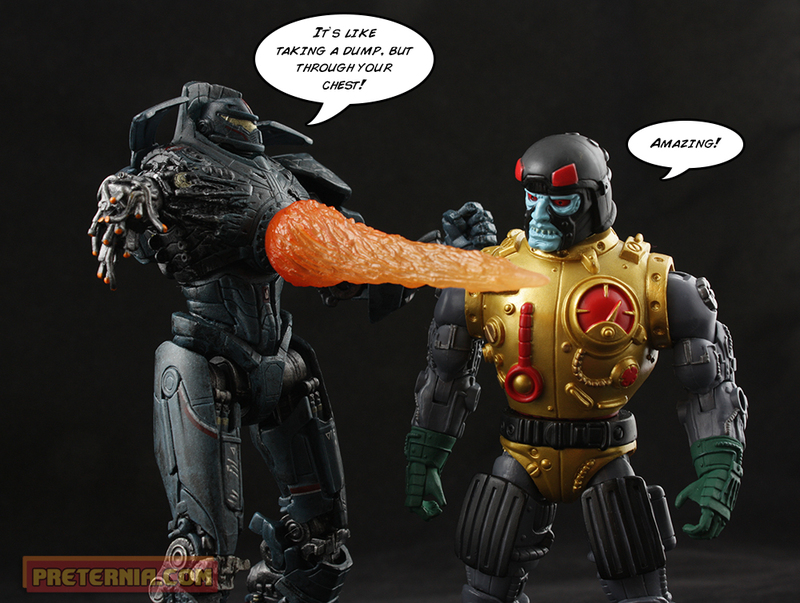 Blast Attak is currently available at Mattycollector, so go grab him there if you want. If for some reason he sells out Amazon is always a good way to go and get a nice deal.